We know what you’re thinking: Glow in the dark denim is totally unnecessary. Okay, but how cool is it to have a perfectly normal looking pair of dark selvedge denim that illuminates when the lights go out? The jean’s glow comes from a phosphorescent coating that absorbs light during the day, and releases a green glow at night. Here’s one good reason to wear them: no more fumbling around looking for your jeans in the dark when you need to bail after an impromptu sleepover. Naked & Famous Denim $240, barneys.com"
The Glow in the Dark selvedge denim jeans is a one of a kind crazy invention by Naked & Famous Denim. These are jeans that really do glow in the dark! Just charge them up in the light (can be natural sunlight or artificial bulb light) and then shut the lights and watch ‘em glow! The jeans will also glow intensely under UV light (aka Blacklight), so if you wear the jeans in a club with a blacklight, your pants will appear neon green! Even the selvedge edges glow so flip up your cuff to flip people out! Just a basic raw black jean that’s a staple in every wardrobe. Made of 95% cotton and 5% spandex. Slight sheen gives it a polished look. First jeans made in the late 1800s were not made of denim; they were made from a sturdy canvas, called duck. Our jean is a lightweight 10oz, but still ultra-durable selvedge version. Dark, soft and cozy denim with what looks like a multicolored blanket lining. It’s one single denim made from 2 warps and 2 wefts woven simultaneously with binding points which is why it’s called double-denim or double-faced denim. The yarns are indigo/black/indigo/tweed. That’s how the jeans get that super rich indigo/black color. You can cuff the jeans for an extra pop of color. It’s a great fall/winter jean. Again- super, super cozy. Barney’s New York and Barney’s COOP exclusive for this season. You won’t find this color anywhere else! It’s a deeply saturated color that will fade nicely. I can’t wait to see a beat up pair of these. 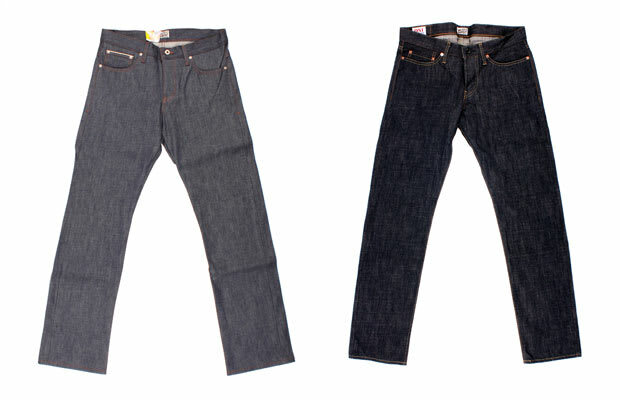 Our first collaboration with Oni Denim from Okayama, Japan. Oni (which means devil or demon in Japanese) is a small cult brand whose reclusive owner refuses to play by industry rules or even do any interviews. He’s a total badass. The denim fabric for this collaboration is super slubby and irregular. It’s definitely one of the most beautiful and rare denims we’ve ever worked with. Just a basic, raw indigo selvedge jean that should be a staple in every wardrobe. A dark, ultra heavy 22oz indigo selvedge denim jean. Basically these are the best value for super heavyweight jeans anywhere in the world. It features a 10oz natural tan bridal leather patch that will also age beautifully. Light blue raw indigo jean. Left hand twill is well known for being a bit softer than it’s right hand equivalent denim. Though it’s incorrect to say that all left-hand twill is softer than all right-hand twill because the type of cotton yarn, weave and other factors greatly affect the “softness” of a denim. But compared to the equivalent right-hand twill denim, a LHT will be a bit softer and have a cleaner surface appearance due to the direction of the spun yarn matching with the direction of the weave.By the way, if you don’t care about all this fabric nerdyness, that’s ok as well. These are simply a clean looking 12.5oz raw indigo pair of jeans for a great price! The jeans work because we apply a phosphorescent coating to the fabric in Japan. This coating is baked into the fabric and will absorb light and slowly release that light with an emanating green glow, just like those Glow in the Dark stickers we had on our ceiling as a kid. Another fun aspect of the jeans is after you beat them up a bit the wear patterns will cause the coating to fade in certain parts of the jean and will create a unique piece of glowing art! We have done 5 wash tests and the jeans still glow nicely. If you want the glow to last as long as possible, wash your jeans as little as possible, (we know you do that anyways) or just dry clean them. Available at Barneys New York and Barneys COOP locations nationwide.